In today’s Wall Street Journal I review a new Broadway production of King Lear. Here’s an excerpt. 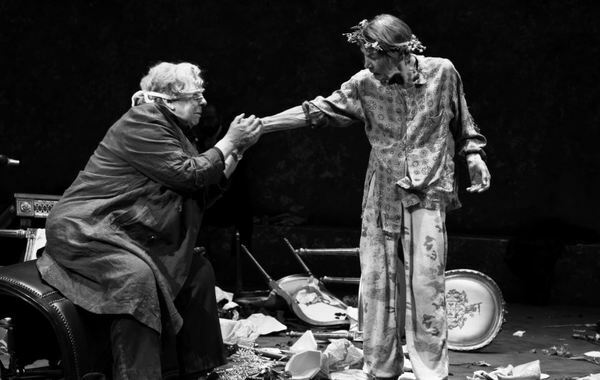 Not so long ago, Glenda Jackson’s “King Lear” would have come as a surprise. Now it feels like an inevitability. Gender-blind Shakespeare productions border of late on the commonplace—I first saw one, Oregon Shakespeare’s “Julius Caesar,” back in 2011—and Ms. Jackson had already played the title role of “King Lear” two years ago in a different production at London’s Old Vic. The real surprise about this “Lear,” directed by Sam Gold, is that it is running on Broadway, where Shakespeare’s darkest, most disturbing tragedy has been produced only twice in the past six decades, in 1968 with Lee J. Cobb and in 2004 with Christopher Plummer. Today, though, “Lear” is well on the way to becoming one of Shakespeare’s most popular plays, so much so that this is actually the sixteenth “Lear” I’ve reviewed in this space (Mr. Plummer’s was the first). The big question, then, is not “Is Ms. Jackson’s ‘Lear” news?” but “Is it good?” The answer, in a word, is…mostly. It’s a mixed bag, but the best parts, of which there are many, will sear themselves into your memory like mental pictures of an unimaginable disaster—which is, after all, what “King Lear” is—while the unsatisfying aspects of Mr. Gold’s staging are never less than tolerable. If you had the good luck to see Ms. Jackson in last season’s Broadway revival of Edward Albee’s “Three Tall Women,” in which she played a rich, senile matriarch, then you won’t be altogether surprised by her approach to “King Lear.” As has been the case with many previous Lears, it takes her a while to get up to speed. Ms. Jackson’s harsh baritone voice has no top, which flattens out the poetry of the first part of the play, and her physical slightness—she is the shortest person in the cast and looks rather like an androgynous marionette—puts her at something of a visual disadvantage. Yet there is nothing slight about her imperious manner, and once the storm blows away her illusions and she declines into self-protective madness, she comes decisively into her own…. Ms. Jackson is not, however, the only member of the cast who is giving a performance on the highest possible level. Indeed, Jayne Houdyshell is so remarkable as the Earl of Gloucester that there are moments when it’s tempting to call her the star of the show. Ms. Houdyshell is a great actor who is usually cast in smallish, quirky parts—this is the first classical role in which I’ve ever seen her—and it is thrilling to watch her expand to fill the space occupied by Gloucester, speaking Shakespeare’s verse with a luminous clarity of which I’d never suspected her to be capable…. In today’s Wall Street Journal I review the Broadway transfer of Heidi Schreck’s What the Constitution Means to Me. Here’s an excerpt. Rarely has a new play by a modestly well-known writer been greeted with such lockstep enthusiasm as has Heidi Schreck’s “What the Constitution Means to Me.” The off-Broadway run having received universally favorable reviews, Ms. Schreck’s play has transferred to Broadway, where it is being touted as a Tony-and-Pulitzer favorite. Sometimes such unanimity is a sign of distinction, but just as often it’s an indication that a play is going over big because it tells the audience precisely what it wants to hear—and nothing more. Such is the case with “What the Constitution Means to Me,” which is not without merit but is no more a masterpiece than Tarell Alvin McCraney’s “Choir Boy,” another recent hit that clangs the bell of cozy progressive sentiment. If you’ve seen any of Sarah Ruhl’s plays, you’ll recognize the tone and approach of “What the Constitution Means to Me,” which is very much in Ms. Ruhl’s aggressively ingratiating manner. It’s a three-person show in which Ms. Schreck plays herself in the present and at the age of 15, back in the days when she earned scholarship money by entering public-speaking tournaments. Her specialty was the American Legion-sponsored competition that gives her play its title. 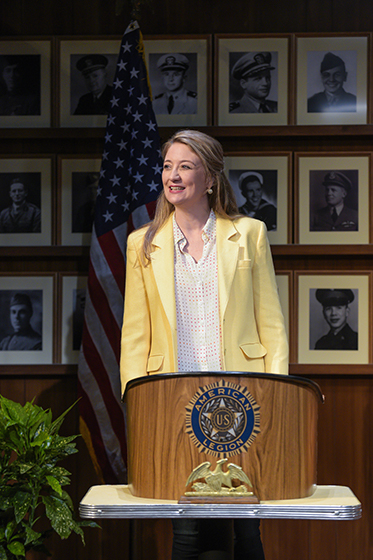 The scene is a small-town American Legion hall circa 1989, and the first part of the play consists of what Ms. Schreck claims to be a close replica of her prize-winning speech, interspersed with present-day reminiscences of her youth, family life and ancestors….